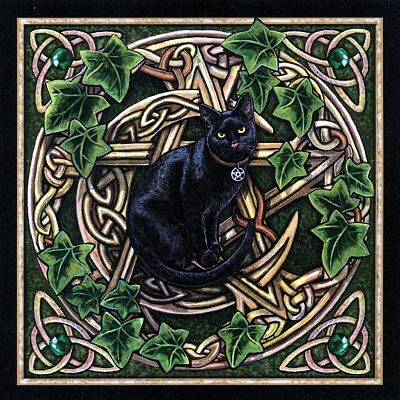 - Festooned with emerald green ivy leaves and gems, this lavishly embellished moon and pentagram make the perfect backdrop for a golden-eyed familiar. The glossy-black cat certainly seems at home in his magical surroundings. The Cat Pentagram Cross Stitch Pattern is based on artwork by Lisa Parker. This is a very detailed pattern, measuring 350 stitches wide by 349 stitches tall. There is no backstitching or half-stitches in this project, just straight cross stitching. But you need to be aware that this is a massive project, with a multi-page pattern, that is probably best suited to experienced needleworkers. 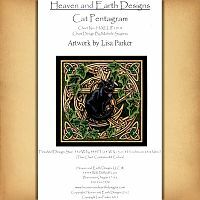 Copyright - Heaven and Earth Designs, Inc.
Do you sell this as a kit? No, this is only the pattern. You will need to provide your own fabric and floss. How large will the finished piece be? That depends on what type of even weave fabric you use. You can figure it out by dividing the number of stitches in the design by the stitch count of the fabric you are using. So, for instance, if you wanted to use 14-count Aida cloth, you would divide 350 by 14, which would give you 25" across. You might have trouble finding Aida cloth that wide! On the other hand, if you used 25-count fabric for the piece, it would only be 14" across (350 divided by 25). Understand? 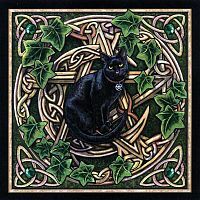 Do you have any other questions about our Cat Pentagram Cross Stitch Pattern?